There’s a pact between the two countries. It’s called the Great Lakes Water Quality Agreement. It takes on all sorts of threats to water in our region… from toxic chemicals to runoff from farms and sewer overflows from cities. Lyman Welch is with the Alliance for the Great Lakes. He says when the agreement was first signed 40 years ago… it was promising. Challenges such as climate change and prescription drugs getting into drinking water. The two countries updated the agreement last fall. Tomorrow, leaders will try to figure out how to implement it. Both countries pledged to do more to tackle invasive species, adapt to climate change and clean up polluted areas. You probably remember that extreme weather was not kind to Michigan crops last year. Frank Szollosi is with the National Wildlife Federation. The federal government has put out a new draft report on how our climate is changing. More than 240 scientists wrote the report. It’s called the National Climate Assessment. Agriculture is one of the key messages of their chapter on the Midwest. The report says in the next few decades, longer growing seasons and rising carbon dioxide levels will increase yields of some crops. Don Scavia is a lead author of the Midwest chapter. He’s the director of the Graham Sustainability Institute at the University of Michigan. He says the agricultural community will also need to find ways to deal with the potential for warmer springs with sudden cold snaps. The report also notes that ice cover on the Great Lakes has been going down since the 1970’s, especially for lakes Superior, Michigan, Huron, and Ontario. Don Scavia says less ice could mean a longer shipping season. But it could also mean more lake effect snow. This is the third National Climate Assessment. For the first time, it includes a chapter on ways we might be able to adapt to a warming climate. He says that means, for example, looking at the infrastructure in our cities and making sure we can deal with heavier storms, and protecting people who are at risk from increased heat waves. The report is open for public comment. State officials have said the fluids used to fracture deep oil and gas wells are to be disposed of carefully. Those fluids typically are millions of gallons of water per well plus a mixture of chemicals necessary to the fracking process. Last summer, the Department of Environmental Quality allowed 40,000 gallons of fluid from fracked wells to be spread on public roads. Paul Brady drives Sunset Trail in Kalkaska County to get to work. He noticed it stayed muddy during a dry period last summer so he traced the wet road directly to a well site. When the issue was raised, the DEQ tested the water coming out of the wells and tested the roadbeds. Hal Fitch is in charge of oil and gas development in the state. Still, the state has decided not to allow brine from fracked wells to be spread on roads to keep dust down. But it says the group trying to ban fracking altogether is overblowing the issue. Ban Michigan Fracking says it’s been waiting for months for the DEQ test data so it can confirm the results. Lake sturgeon are amazing fish. They can weigh several hundred pounds and they can live to be a hundred years old. Sturgeon used to be abundant throughout the Great Lakes region. But they were overfished, and construction of dams on rivers where they spawn hurt their reproduction. They’re now a state threatened species. Tim Cwalinski is a fisheries biologist with the Michigan Department of Natural Resources. He says these days, sturgeon are carefully managed. There are a few fishing seasons for sturgeon in different parts of the state. 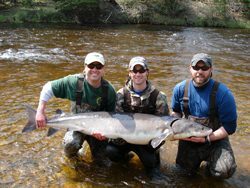 The season for sturgeon in Black Lake in Cheboygan County opens February 2nd. Tim Cwalinski says there are about 1,200 adult sturgeon in the lake. The quota this year is just six fish total for all the fishermen combined. So the fishing season can be over in just a matter of hours. Canons are fired and sirens go off when the season closes. Cwalinski says fishermen typically use spears to catch sturgeon on Black Lake. He says the sturgeon population in Black Lake is strong enough to support a limited harvest. The lakes around Cheboygan have a long history of spearfishing for sturgeon. There’s even a festival celebrating sturgeon season called the Black Lake Sturgeon Shivaree. It used to be that fuel-efficient cars were not taken all that seriously. But that’s changed. Jim Motavalli is the author of High Voltage and a blogger for the New York Times and Car Talk. He joins me from the North American International Auto Show. 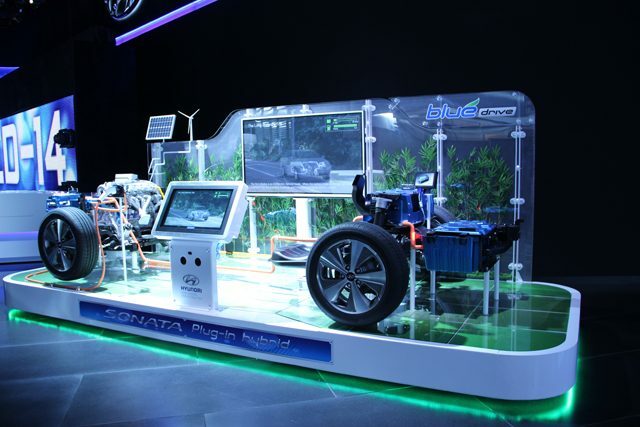 Jim, there’s no such thing as a “green car” section of the auto show – because everyone is seeking better fuel economy. What’s driving that? 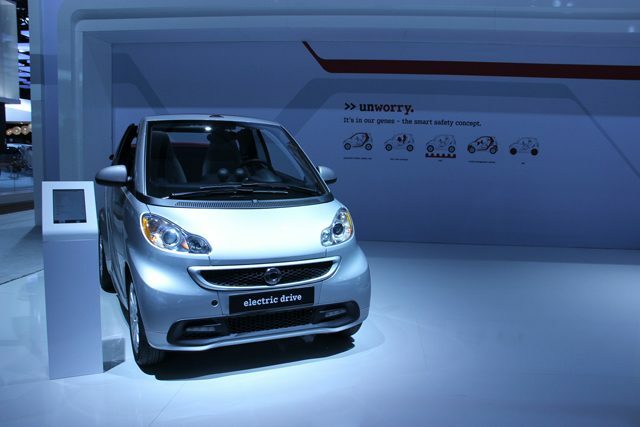 RW: You mention the 54.5 miles per gallon by 2025 standard – how are automakers going to meet that? RW: What kind of cars do you see most of us driving 20 or 30 years from now? 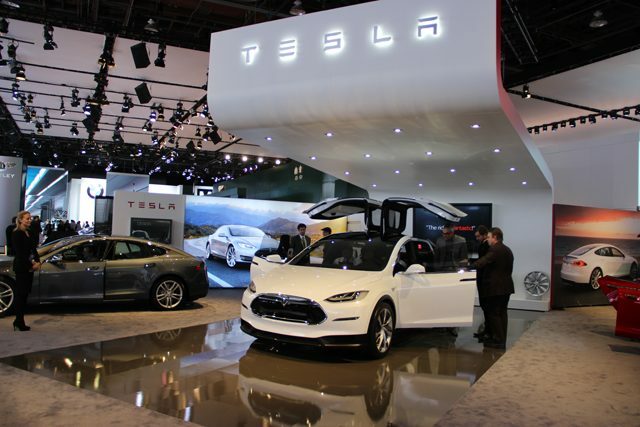 Jim Motavalli is the author of High Voltage and a blogger for the New York Times and Car Talk. Thanks so much, Jim! The Great Lakes are incredibly complex. There are just a lot of moving parts. 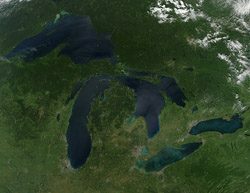 A new project is taking on a giant task… to try to predict the future of the Great Lakes and what we might want the region to look like. 21 research institutions from the U.S. and Canada are collaborating on the Great Lakes Futures Project. It’s not just a classroom exercise. Along with researchers and grad students, government officials from the U.S. and Canada are involved, and so are industry and environmental groups. This week, people from around the basin got together for their first workshop. That’s Gail Krantzberg. She’s the director of the Center for Engineering and Public Policy at McMaster University. She’s also the co-chair of the project. One of the things that’s sort of unusual about this project is that it’s not just a bunch of professors sitting around debating each other. Krantzberg says they intentionally put grad students in charge of the research. So – these teams of grad students (with faculty mentors) spent the past three months researching the biggest things that drive change in the Great Lakes region. Things like energy, economics, pollution… climate change… invasive species. Matt Cooper is a PhD student at the University of Notre Dame. Yesterday, the student teams presented their work. They laid out a couple different scenarios for the future. So… for example, the team assigned to invasive species had four different possible futures. They had to imagine what the future might look like if regulations on ships change… or what might happen if we don’t close canals. It was a tough crowd. The students got grilled. Don Scavia directs the Graham Institute at the University of Michigan. He’s another chair of the project. He says they set things up this way on purpose. He says he likes making people a little uncomfortable. And in fact… that’s one of the things that drew George Kuper to the workshop. He’s with the Council of Great Lakes Industries. Next, everyone – with all these different points of view – will sit down together and imagine four possible futures for the Great Lakes. They’ll take a look at what policies are in place and where we’re heading as a region… and whether we want that kind of future. They’ll have another workshop, and then they’ll take the show on the road to Ottawa and Washington D.C. to get lawmakers involved. With all the buzz around the fiscal cliff in Congress… something happened that you might’ve missed. 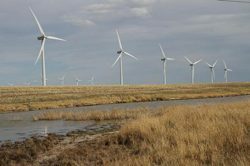 There’s a federal tax credit – it’s called the wind energy Production Tax Credit. And it was about to expire at the end of last year. At the final hour, Congress extended that tax credit, and President Obama signed the bill. It now covers wind projects that start construction in 2013. Peter Kelley is a spokesman for the American Wind Energy Association. He says the credit gives tax relief for the first ten years of a wind farm. Kelley says companies had started laying people off last year with the future of the tax credit up in the air. He says in Michigan, there are at least 41 factories that make components for wind turbines. All the water we use in our houses and businesses goes down a municipal drain and ends up in a wastewater treatment plant. It’s processed and decontaminated and eventually becomes something called a biosolid. Some of it then goes into landfills… and some is used as agricultural fertilizer. A law signed last week will allow Michigan’s sewage treatment plant to sell or give away what’s called “exceptional quality” — or EQ biosolids. Mike Person is with the Michigan Department of Environmental Quality. He says other states have allowed this for years. In fact, Michigan’s been buying a product called Milorganite that’s been generated and bagged by the city of Milwaukee. The new Michigan regulations eliminate a layer of bureaucracy. It means these biosolids could be used in public parks, athletic fields, cemeteries, plant nurseries… and on your lawn and garden. Person says that’s an environmentally smart thing to do… rather than putting biosolids in landfills or incinerating them. Now, in order for these biosolids to be given or sold to the public, they have to meet certain criteria. Dawn Reinhold is an assistant professor in biosystems and agricultural engineering at Michigan State University. She says pathogens like E. coli, salmonella and viruses have to be eliminated. So do harmful metals. Reinhold says she’s researching another aspect of biosolids: What happens to all those personal care products when they get into the water system? Reinhold’s studies looked what would happen if you were to eat only fruits and vegetables grown in a garden amended with biosolids. She says the health risks would be a thousand to 10,000 times less than from using things like antimicrobial soap in the first place. But there’s one area that still needs work. Reinhold says all those pharmaceuticals Americans use also end up in those treatment plants. So Reinhold says using biosolids for landscaping limits your exposure to pharmaceuticals to just about nil, and if you’re not comfortable using biosolids in your veggie garden? Go organic. The experts are still finalizing the data, but it looks like 2012 will go on the books as the warmest year in the U.S. in recorded history (ever since 1895). Jeff Andresen is a professor of geography at Michigan State University. He’s also the state climatologist, and he joins me now. 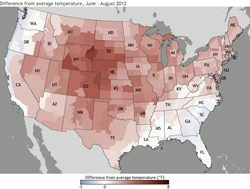 So… 2012 looks like it’ll be the hottest year on record for the U.S. What about in Michigan? RW: One of the analogies I’ve heard is that climate change is loading the dice so there’s a higher probability that we’ll roll more extreme weather events. Looking into the future, what kinds of extreme events could we see more of in Michigan? Andresen: “Well, the projections for the future, in general, all of them call for warmer temperatures in the future for our part of the world, without exception. They also suggest wetter… some of the projections say wetter, some actually say drier, but the majority say that we will have more precipitation in Michigan. The key or the caveat there is that the timing of it might be different. Increases in precipitation are thought to perhaps be concentrated during the cold season, in the winter; maybe in the spring, we’ll have some of that precip falling, maybe in liquid form. And that is a concern because the forecasts for summer precipitation are basically level. Some of them even call for less precip in summer and certainly for agriculture, for natural systems, that’s when our water needs are the greatest. Plants need water during the warm season, the growing season, and that is a red flag certainly as we look ahead. RW: Jeff Andresen is a professor of geography at Michigan State University. He’s also the state climatologist. Thank you so much! Noah Link is the owner of Food Field. He lives and works in Detroit. His four acre property is on the site of a former elementary school. Imagine a farm tucked away in the city. Link and his business partner worked on several farms across the country. So they knew owning a farm wouldn’t be easy, but they’re doing the hard work. 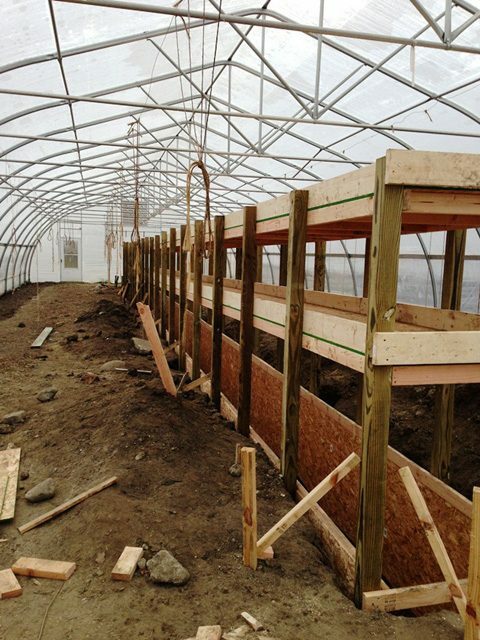 On the land are all kinds of crops, some chickens, a beehive, and a young orchard of fruit and nut trees, and there’s a hoop house to grow vegetables year-round. Aquaponics is a combination of hydroponics and aquaculture – growing plants in water, and fish farming. Link’s system is a long underground tank for the fish, and raised beds above the tank where he plans to grow greens and tomatoes. A lot of people who do aquaponics raise tilapia. They’re fast-growing fish. But they’re also tropical and need warm water. So Link wants to raise bluegill and catfish because they can withstand colder water, and save him potentially thousands of dollars in heating bills. He’s also trying to fill a void in the city. Detroit often lacks access to fresh produce and Link wants to change that with locally-grown fish and vegetables. 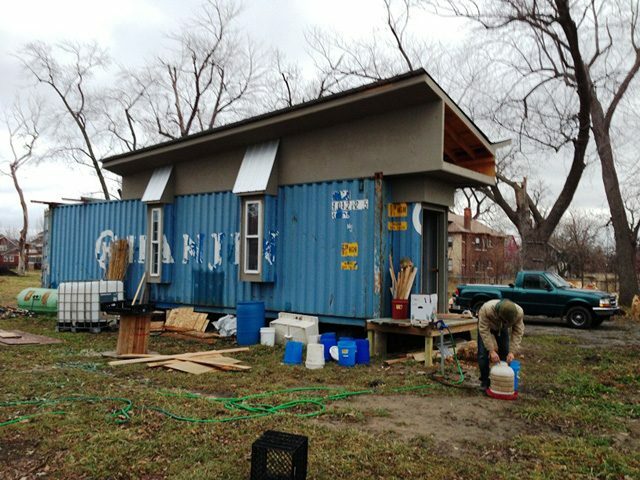 But Link, and others who’ve joined the urban agriculture movement in Detroit, have been working pretty much under the radar. Kathryn Lynch Underwood is a city planner with the city of Detroit. 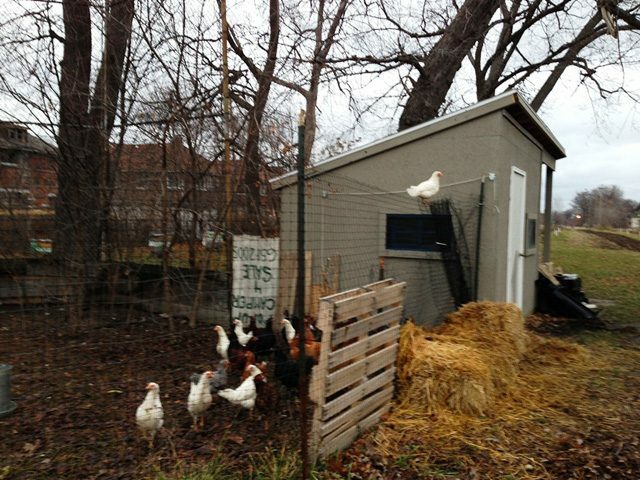 She helped create the new Urban Agriculture Ordinance. The ordinance will go to the Detroit City Council and Mayor Dave Bing for consideration early next year. If it’s approved, it could open the door to more fish farming in Detroit. For the Environment Report, I’m Mercedes Mejia. The Great Lakes are under a lot of stress. 34 different kinds of stress, to be exact. 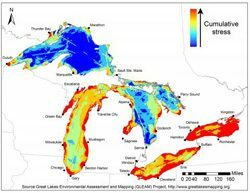 That’s according to a research team that has produced a comprehensive map showing many of the things that stress the Great Lakes. Think: pollution, invasive species, development and climate change… just to name a few. To learn more about this new map, I went to visit David Allan. He’s a professor in the School of Natural Resources and Environment at the University of Michigan, and he’s one of the people who led the project. David Allan is a professor at the School of Natural Resources and Environment at U of M. I’m Rebecca Williams. Michigan Radio’s Lindsey Smith has been writing about the plant through the turmoil. She joins me now for a sort of year in review. So, Lindsey, last month, federal regulators upgraded Palisades’ once poor safety rating to the best rating possible – is the plant safer now? LS: The Nuclear Regulatory Commission says the plant was always operating safely or they would have shut it down. It’s got a pretty low threshold for screw ups. So the safety rating is a very technical process to measure a plant’s performance. It can be really confusing to hear that the rating jumped so dramatically – even though there’s been a number of water leaks at the plant – as recently as last month it shut down to fix a broken valve. This is Bette Pierman addressing the NRC at a meeting Tuesday night. She lives 15 miles away from the plant in Benton Township. I asked NRC’s Regional Administrator Chuck Castro pretty much the same question during a press conference before the meeting. Why not gradually increase the safety rating if there are still problems? LS: So the bottom line: Entergy fixed the two issues that got Palisades the bad safety rating, but they’ve got these new problems with the leaks that aren’t directly tied to the safety rating, but that regulators still want to keep an eye on. RW: Now I remember you saying that there will still be more regulators than usual at Palisades next year, even though they’ve been upgraded to this better safety rating. LS: Yes, definitely. So, inspectors at the plant feel they need more support to make sure these mechanical problems causing the leaks get taken care of. Castro petitioned his superiors in Washington to pay for an extra 1,000 inspection hours next year. The plant will need to shut down next fall to replace spent nuclear fuel with new stuff and at that time inspectors will be able to get into places that you can’t usually get at when the plant is running. 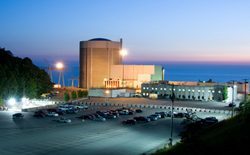 So they should be able to get a more comprehensive look at the inside of the now 40 year old reactor with those extra inspection hours. RW: What is the company, Entergy, saying about the extra inspections? LS: Entergy officials were pretty clear that they are not satisfied with the plant’s performance yet either. They have this three year plan to return it to “operational excellence,” as they call it. They have replaced some people in key leadership positions as part of that plan. And they’ll get results of a new independent safety culture assessment early next month to see how they are doing. You can listen to today’s Environment Report or read an expanded version below. Scientists and government officials have their eyes on a watchlist of 53 species. It’s a list of the species that are most likely to become established in the Great Lakes region if they get in. Take for example: killer shrimp. Rochelle Sturtevant is a Regional Sea Grant Specialist for Outreach at NOAA’s Great Lakes Environmental Research Lab in Ann Arbor. 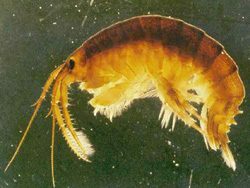 She says killer shrimp are native to Europe but they haven’t been found in the U.S. yet. Sturtevant and her colleagues recently launched a searchable online database – with pictures of the potential new invaders, and fact sheets about them, drawn from the available peer-reviewed research on the species. She says it’s a work in progress – in some cases there’s not much scientific literature available on a particular species – or it’s in foreign language and needs to be translated first. She says scientists are always on the lookout for new potential invasive species in the lakes. But she says usually – scientists are not the ones who first find them. She says you can report sightings of non-native species to the U.S. Geological Survey online or by phone: 1-877-STOP-ANS. Sturtevant says it’s good to note the date, location where you saw the critter or plant and either a photo or specimen. In May, a road crew dug up the bones while backfilling a trench along U.S. 23. James Robertson is the Michigan Department of Transportation’s senior archaeologist. He says Oscoda’s U.S. 23 road project had federal funding. So a 1990 law called the Native American Graves Protection and Repatriation Act went into effect. This provides a process that returns human remains, valuable or sacred objects, and objects of cultural significance to Native American tribes. These items are occasionally dug up around the state’s former Native American lands. But Robertson says MDOT’s 2 staff archaeologists use a variety of tools to try and avoid disturbing sites at all. When they are human bones, Robertson says there are three steps. First, they work with local authorities to determine if it’s a recent event. If so, local law enforcement takes over. If not, MDOT works with Michigan State University’s Forensic Science lab to determine the bones’ origin. 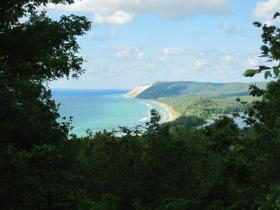 MSU’s team identified the Oscoda remains as Native American. So James Robertson is working with the Saginaw Chippewa Indian Tribe. William Johnson is the curator for the Ziibiwing Cultural Center for the Saginaw Chippewa Indian Tribe. Johnson is the lead for these kinds of situations. The center has been working closely with MDOT to rebury native remains – since 1996. He says that final step is an important honor for their tribal members. Johnson says his tribe feels it’s a privilege to take care of the elders who provide the path that they follow today. For the Environment Report, I’m Chris Zollars.